You can support a variety of initiatives with a donation to the Arnprior Public Library. You can determine the amount to support children's programming, expanded adult programs, new books and resources or furnishings (such as moveable shelving units). In addition to the secure online platform on Canada Helps, you can also make a donation in person at the library. Donors receive a charitable tax receipt. Donations greater than $100 receive recognition on our donor wall. Please provide wording when stipulating how you would like to see your donation used. Individuals, service clubs, community groups and businesses have all helped the library. 100% of donations are used in the designated areas of gift giving. 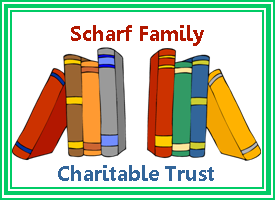 Special thanks to the Scharf Family Charitable Trust that has allowed the library to offer all of its summer programming free of charge beginning in 2018.